A palomino named Nugget overcame a condition that caused severe weight loss thanks to the Large Animal Hospital team at PVM’s Veterinary Teaching Hospital. When Nugget arrived at the Large Animal Hospital, she was alert and her physical exam was within normal limits, but she was more than 40 pounds underweight and her symptoms were persistent after several months of unsuccessful treatments. After some testing, Dr. Kira Tyson, a large animal medicine intern, diagnosed Nugget as having “sand enteropathy,” a condition that occurs in horses that are kept in a muddy or sandy enclosure and who graze on sandy ground. Sand ingested as part of their day-to-day routine builds up over time and compacts in the gastro-intestinal system, causing symptoms like fatigue, weight loss, watery stools, and abdominal discomfort. When a veterinarian listens to the horse’s abdomen, it often sounds like “waves on the beach,” and an abdominal ultrasound will show a clear line in the imaging where the sand sits in the stomach and intestine. Yet after several months of treatment with the psyllium added to Nugget’s feed, her symptoms remained unchanged. Led by Dr. Sandra Taylor, assistant professor of large animal internal medicine, the VTH medical team needed a more aggressive approach, and decided to keep Nugget as an inpatient. They administered a combination of mineral oil and psyllium directly to Nugget’s stomach through a nasal-gastric tube. After five days of twice-daily treatment, Nugget had passed enough sand to go home. 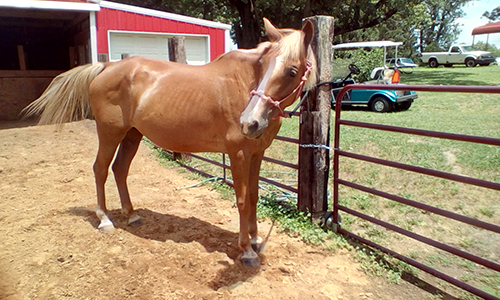 “Nugget is a gait horse, and the owners said as soon as they turned her out to pasture she did her fancy walk. She was feeling pretty good,” said Dr. Tyson.